Note: This blog post was written by Kelly Wels’ 17 year old son, Hanz. Ah puberty, that magical time where proper hygiene is really important. Shampoos, soaps, face wash, conditioner, lotion, and especially, deodorant suddenly become routine. But what is really in that gel stick that you apply every morning? A quick look at the back label may provide some clue… Well, maybe not, unless you happen to know what Aluminum zirconium tetrachlorohydrex is. It is easy for harmful substances to get lost in the complex chemicals and foreign ingredients in an antiperspirant deodorant. Which brings us to the main point. Starting off familiar, fragrances are the manly pine forest or the feminine flower field that are added to almost every deodorant. Smelling good comes at a cost, however, many of these fragrances are artificial, and many of these are either harmful to the body or have unknown effects. “Palm oil? Why does a natural ingredient with such a harmless moniker warrant concern?” You may ask. Well, it isn’t necessarily for personal health, but every year thousands and thousands of acres of rainforest are chopped down to make room for palm oil plantations to support the cheap, versatile use of palm oil in products ranging from cosmetics to food. A healthy, natural lifestyle means not only protecting yourself, it means protecting the world we live in. Since aluminum is known to health-conscious individuals as bad, leading ‘natural’ deodorant companies boast the absence of Aluminum chlorohydrate, but the main ingredient in these deodorants is potassium alum. Sounds harmless, but potassium alum is just another name for potassium aluminum sulfate-which not only has aluminum, it contains sulfates as well! 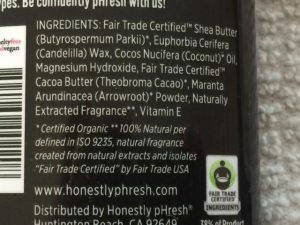 “Natural Deodorant” that contains the ingredient ‘Potassium Alum’. These sticky fellows are what help the product itself adhere to the hair/skin of the armpit. A quick look at Wikipedia tells us that phthalates are plasticizers, or the compounds added to plastics to help durability and flexibility. It is commonly found in packaging, vinyl flooring, and building materials. Oh yeah, and your deodorant. Ah yes, the big bad one. The most harmful of our friends on this list, aluminum, or whatever variant it may hide in is found in almost every antiperspirant deodorant. Aluminum is linked to cancer, Alzheimer’s, autism, infertility, brittle bones, and more. Not really worth no sweat, is it? A ‘traditional’ anti-perspirant with main ingredient of ‘Aluminum Zirconium Tetrachlorohydrex’. But how does it actually work? The basic concept of aluminum-based antiperspirants is that is physically blocks the sweat glands, a natural process. This is just the tip, however, aluminum can be absorbed by the skin and slowly accumulate over years of swiping back and forth. It may not strike now, but over time it can build up to harmful, or even toxic levels. Thankfully there is an alternative to the chemical-laden antiperspirants on the market. I used pHresh deodorant to try as a substitute, and I was pleasantly surprised. The scent was natural and pleasant However, being seventeen, I sweat. A lot. pHresh did its best to help me throughout the day, but did require multiple applications. I was overall pleased with the results, and I find it a fitting substitute to keep you smelling good and pHresh! pHresh deodorant is made with completely aluminum free ingredients. 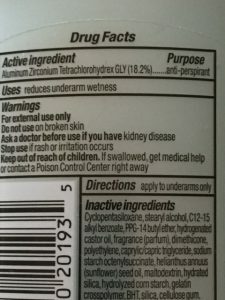 This entry was posted in Blog and tagged aluminum zirconium, dangers of anti-perspirants, pHresh deodorant. Bookmark the permalink.